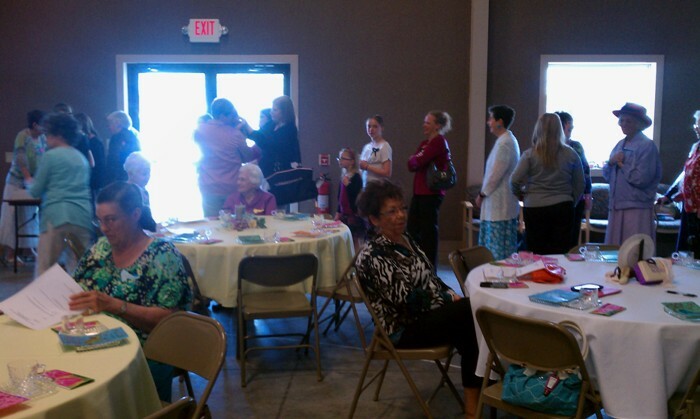 This year I spoke at the ladies’ tea at the Archie Baptist Church in Archie, MO. The theme and my speaking topic were Lord, Order My Steps. God surprised me there! 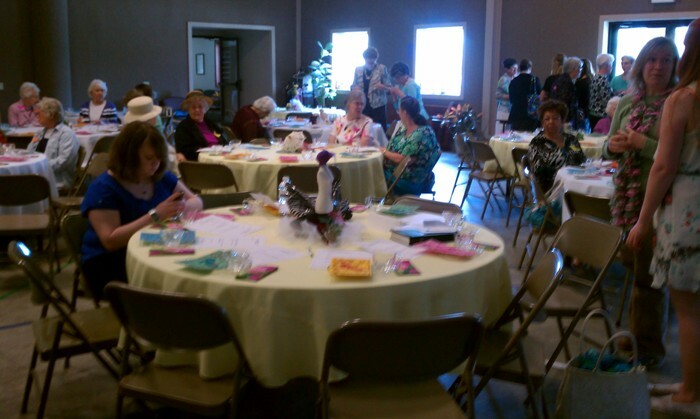 Archie is a small, rural town so I thought not many women would attend. I’d only made 15 handouts (figuring only 15 to 25 at the most would show up), and to my shock and delight, the room was FILLED with women! The ladies made me feel so welcome and were so friendly, especially Amber, Tracey, and Sue Wilt who was hilarious. Sue was, I found out later, one of my friend’s aunts! Small world. I was so grateful to my daughter Heather’s friend, Amber Welton, who thought of me as a speaker and invited me to speak there! Sue commented that she noticed Leah was “taking notes” as I spoke. 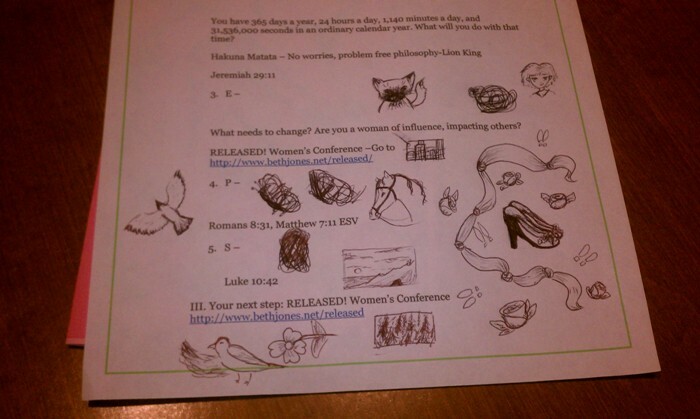 What Leah was actually doing was drawing/doodling on her handout. Below is a pic I snapped before we began. Our daughter Leah (in blue top, center) is checking her phone, of course! Here were more women standing in line to register before we began. 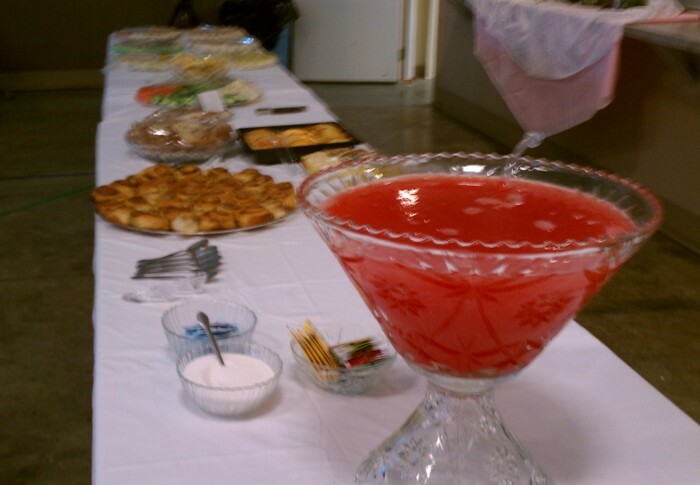 The tables had crystal glass plates and cups for the yummy hors-d’oeuvres and delicious punch. 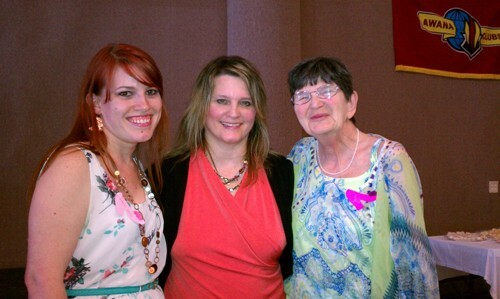 Gwen Knibb sang the precious solo, “Via Dolorosa” (God knows I love Israel!) 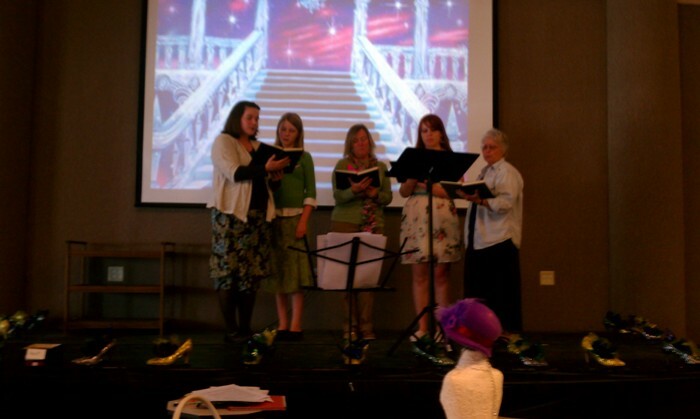 and the “Tea Time Singers” beautifully sang “Footsteps of Jesus.” Are you walking in all God has planned for your life? Christina McGinnis offered the blessing and gave us a poignant reminder, through the shoes she wore that she said weren’t her most comfortable pair: our “shoes” won’t always be so comfortable. God often calls us out of our comfort zones to obey Him. When we do, we’ll experience His blessing. One of the beautiful, precious women who talked with me before we started was Victoria, who’s in the marketing business for speakers, writers, and other business owners. She shared with me that she’d love to start publicly speaking, teaching women what she has learned in her life about God’s unconditional love (no matter what you’ve done wrong!) and about the beautiful relationship she has with Jesus Christ. I encouraged her that God gives us the desires of our hearts, and as she seeks Him and walks in obedience, He will open doors and give an outlet for her to speak ~ just like He has with me! God is the DREAM GIVER and the DREAM FULFILLER! Amen. Selah. Another woman I spoke with, Donna, shared about a friend of hers, who has visited Israel numerous times and she had visited Israel herself. I’d mentioned during my presentation time that Ray and I visited Israel several years ago. This little tidbit was something that connected me with a woman in the audience. I hadn’t planned to talk about Israel, but do you know that God will put His right-on time word in your mouth? S- Spend time with God daily in prayer, reading the Bible, and worship. This is basic Christianity 101, but do we faithfully do it? The first step for God ordering your steps is to have a relationship with Jesus Christ. All you have to do to be saved is call on the name of Jesus Christ. (Romans 10:13) Spend time with God every day, even if it’s just a few minutes a day. As you pray, your hunger and thirst for God’s presence and His word will grow and you’ll want to spend even more time with Him. T – Time Management. Learn to manage your time wisely. Don’t waste your time or your spiritual gifts. Are you on Facebook or Pinterest all day long? Sometimes God wants us to just relax and have fun; at other times, He wants us focused solely on Him and His purpose for your life. Are you procrastinating or holding back in fear from doing what God has called you to do? Take your calling seriously. E – Examine Your Life and Heart. What is going well? What needs to change? Do you need transformation in your life? 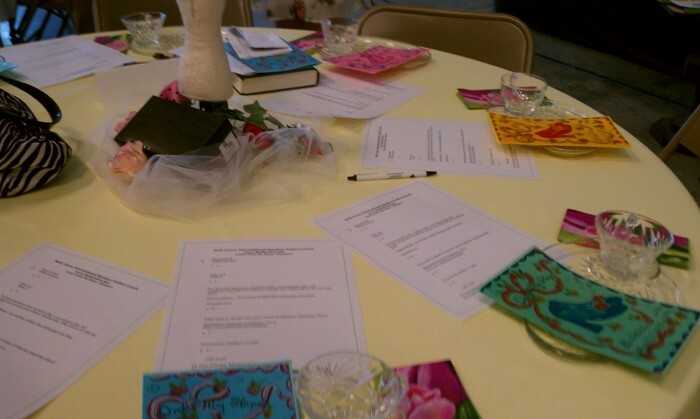 If so, pray about coming to the Released Women’s Conference on April 27 just outside Kansas City, MO. (Click here to find out more.) How are your relationships? Are you being all God designed you to be? Are you using your gifts for Him? P – Priorities and Planning. Remember that Mary chose the best part which wouldn’t be taken from her – sitting at Jesus’ feet, learning from Him. We women are like “Octo-mom” – an octopus with many arms, doing many things at once, great at multi-tasking. But even though we can do lots of things at once, that doesn’t mean it’s best. Usually there are one or two important tasks that God wants us to do each day. He may want you to spend more time with your husband, child, or a friend. He may want you to speak somewhere or to work on writing your book. What is your next step? What steps are God telling you to do right now to fulfill your life purpose? S – Stay The Course. Don’t get distracted or let your faith be shipwrecked. Don’t doubt but trust God. Like Jesus told Peter after the resurrection, don’t worry about anyone else or compare yourself to him or her. You follow Jesus. Fulfill the God-given calling that is on your life.